Green Tea Extract is a popular supplement promoted as a powerful antioxidant and alertness aid. Some also promote it as a weight loss aid, but these claims are unfounded. Green tea extract supplements can vary in caffeine content. The above listing is for the NOW brand pictured. Some brands also add more EGCg and/or use decaffeinated tea leafs, so always check the label of the brand you choose. Natural Goal: 32 mg per capsule. Advanta Green Tea X-tract: 35 mg per capsule. 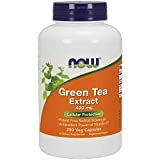 Life Extension Mega Green Tea: 3.6 mg per capsule. NutriGold Decaffeinated Green Tea: 5 mg per capsule. As you can see, brands vary widely, so it can be very confusing for consumers. Although in general, decaffeinated brands have 0-5 mg per capsule and other brands have 25-40 mg per capsule. 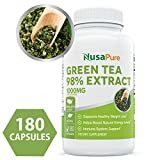 Green tea extract isn't recommended for pregnant or nursing women or those sensitive to caffeine. NOW Brand: Vitamin C, Green Tea Extract, Gelatin, Magnesium Stearate.